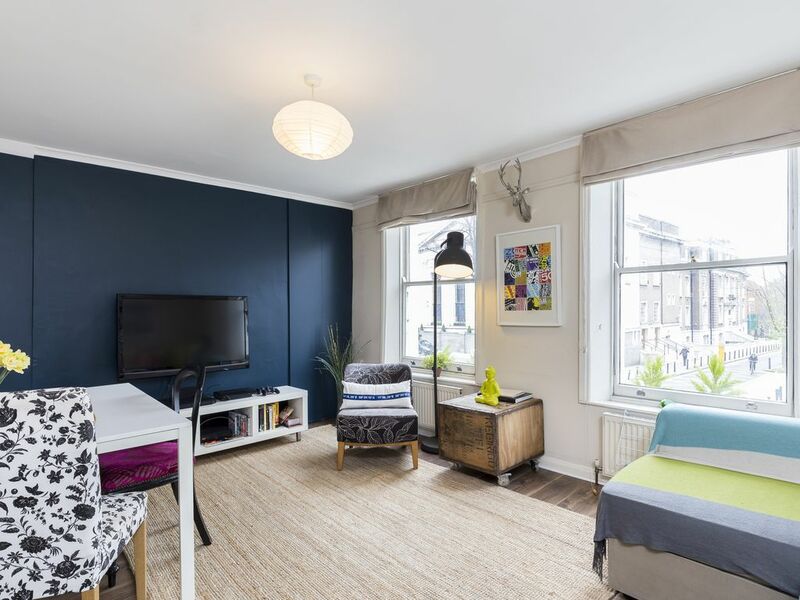 Contemporary design meets classic London, this newly-renovated period flat is situated in the heart of lively and desirable Angel, Islington, N1. Just a stones throw away from Londons nightlife, theatre and restaurants, and minutes away from Londons best attractions, giving you the perfect base to begin your authentic London experience. Clean, comfortable and equipped with all the amenities you need, plus impeccable service, the apartment is ideal for families, leisure or business travelers. This exceptional 2 bedroom property will ensure your stay is comfortable, convenient and memorable. A master bedroom with a king-size bed, comfortable mattress and down pillows and bedding. Additional bedroom that opens out onto the patio / terrace and double bed that can folded into single if desired. The living room, ideal for a couple and for 2 children, with a sofa-bed and 1-2 single beds- luxury blow up beds A baby crib and high chair can also be offered. A fully-equipped, modern kitchen complete with every appliance and utensil you need, including a blender, Juicer and complete food processor; oven and hob, microwave; and the latest Nespresso coffee machine with a selection of flavour capsules. Dishwasher and washing machine as well A bathroom with a bath and shower, fresh towels, a hairdryer and a selection of luxury soaps and shampoos from The Body Shop. A huge living and dining area A terrace outside where you can sit out and enjoy your morning Nespresso, under the shade or in the open part in the sun The dinner table, with chairs and stylish extra stools, means cooking and eating a delicious meal for your family or friends is easy and enjoyable whether youre fixing a quick bite before heading out or celebrating with a full course dinner. High speed broadband internet/Wi-Fi with 3 backup connections - ensures you stay connected throughout your trip great news for our business travellers. A courtesy UK mobile phone is also provided for your use during your stay and we have power adaptors and USB charging stations throughout the apartment. The entertainment system comes with a 42-inch plasma TV, cable TV, a Blu-Ray and DVD player, an iPod docking station with speakers and a PlayStation PS3 console with a selection of games, keeping you (and especially the kids) occupied on rainy or tired days. Central heating with digital easy-to-us controls (and theres no AC and no need for it in London) A handy instruction manual for every detail of your stay, plus a friendly, helpful service from myself (the owner) and my team, who offer great multilingual communication and support. Sleeping FAQs Make the most of everything this exciting city has to offer without compromising on sleep and relaxation. This apartment is located on a substantially quieter block than the rest of this busy area. The bedrooms are at the back of the property, with blackout curtains, double glazed windows and the latest memory foam mattresses, all dressed in luxurious all-year cotton duvets, with 2 pillows per guest. A baby crib and high chair can also be offered. The apartment consists of a 1st floor of a renovated period building, accessed by stairs. Entry is via an intercom with buzzer for security, all doors have two locks. It can be rented for short stays from 2-3 nights, with discounts for stays of 6 nights or more. This discount increases for 12 nights or more, and bookings can be made for stays of 2-3 months. The price is inclusive of all utility charges and taxes, with no surprise extras. All bedding, sheets, and towels are provided, with checkout cleaning and laundry also included. Should you wish to do laundry during your stay, there is a washing machine in the apartment. This flat is managed by a professional support team who consistently provide outstanding customer care. The multilingual team speak English, Italian, French, Portuguese and Spanish, to answer all your questions and needs. We have a housekeeping and maintenance team to ensure that your flat will be spotlessly clean upon arrival. Our housekeeping service is always eco-friendly, using only environmentally-safe cleaning products. We welcome children, under adult supervision. For your convenience we will meet you at the apartment on arrival so you dont have to go to an office to collect keys. We will provide you with 2 sets of keys and all the information you will need for your stay. We look forward to welcoming you to London! The apartment consists of a 1st floor of a renovated period building, accessed by stairs. Entry is via an intercom with buzzer for security, all doors have two locks. It can be rented for short stays from 2-3 nights, with discounts for stays of 6 nights or more. This discount increases for 12 nights or more, and bookings can be made for stays of 2-3 months. The price is inclusive of all utility charges and taxes, with no surprise extras. All bedding, sheets, and towels are provided, with checkout cleaning and laundry also included. The host cancelled the reservation on the day of check in. This is an auto-generated review posted on behalf of the guest. The only "negative point", the flat is just above a bar, this make it a little bit noisy during the night however this did not prevent us from sleeping. I higly recommand this flat. We loved the apartment. It's just a nice place and great location as well as the neighborhood was OK. We'd love to come back in the future. Very lovely and comfortable house. Great position and value for money. Very kind and helpful owner.